The EVCDS is completely air cooled with a very compact, easily integrated package requiring very little maintenance. With an expected lifetime for the pump diode of over 500,000 hours, down time is dramatically reduced. Because of the modular fiber coupled design, diode replacement can be completed quickly with no need to realign the laser. The compact footprint of the system allows for the easy integration into both manual off line and automated in-line applications with Marking-On-The-Fly (MOTF) support for high volume applications. 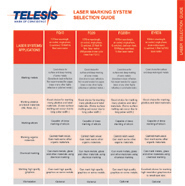 The TELESIS EV15DS marker is based on advanced Q-Switched, fibercoupled diode end-pumped Nd:YVO4 laser technology. The outstanding beam quality of the EV15DS makes it superior to all other markers of equivalent power for high resolution and high speed marking. Additionally, the shorter pulse widths and high peak powers of this marker makes it the preferred choice for challenging marking applications on silicon or heat sensitive materials such as plastics or thin foils. 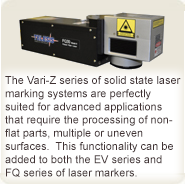 The EV40 is a high throughput laser marker featuring a Q-switched Nd:YV04 diode pumped, aircooled laser design with high speed digital galvo scanners. This laser provides high quality laser beam characteristics including a long focal tolerance combined with up to 2mJ pulse energies and high average powers at 1064nm, allowing these systems to achieve high-speed, rapid deep marking of metals or composite materials on flat and curved surfaces and offers the user best-in-class reliability with a low cost of ownership.